I rediscovered an interesting 2009 article from NCSS about lecturing in the Social Studies classroom. So I thought I'd share it here for folks to read. 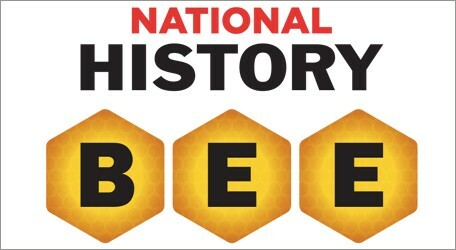 The National History Bee is an academic competition for elementary and middle school students that tests knowledge of a wide range of historical topics. To participate, you must join by clicking here. It does cost $150 for a school, so maybe the PTA can help. To see what it does, click the video below. 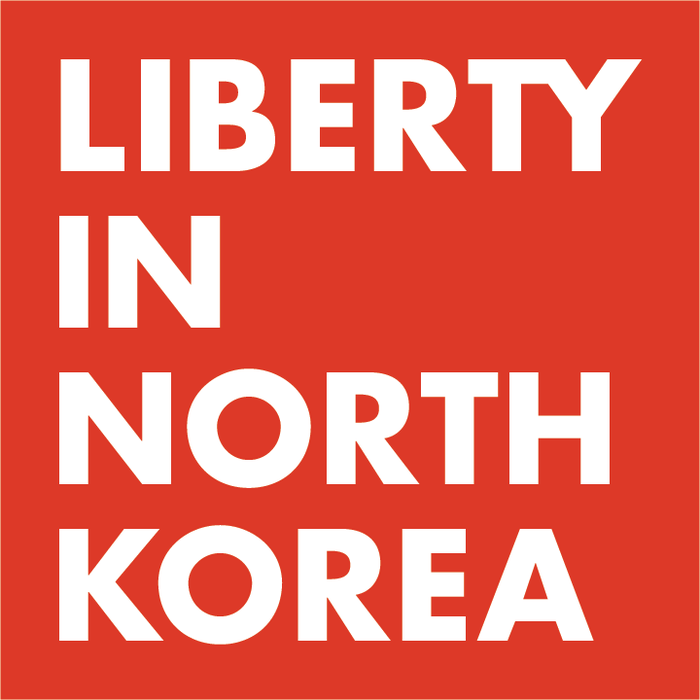 If you're interested in having your students hear about life in North Korea, check out Liberty in North Korea. They are currently touring and have a 30 minute presentation that they can give your students. And... it just costs $100! The speakers are just barely out of high school. They also take questions from the crowd. Check out the video below for what you might see. If interested, let me know. They will be in Richmond Oct. 9 and 10. The First Freedom Center is holding its annual essay contest for students. 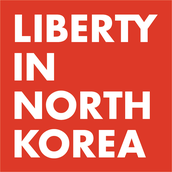 The First Freedom Student Competition is a first-semester national essay and video contest. 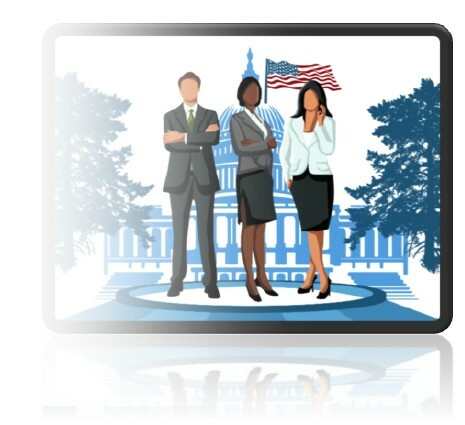 It offers high-school students an opportunity to compete for $2,500 awards as they examine the history and current-day relevance of religious freedom, and then, by written essay or video production, present their evaluation. The competition is open to students in the United States and U.S. territories, and to American schools and American home-schooled students worldwide. We invite 9th — 12th grade students at all levels of academic placement to participate. Students must register by November 17, 2014. 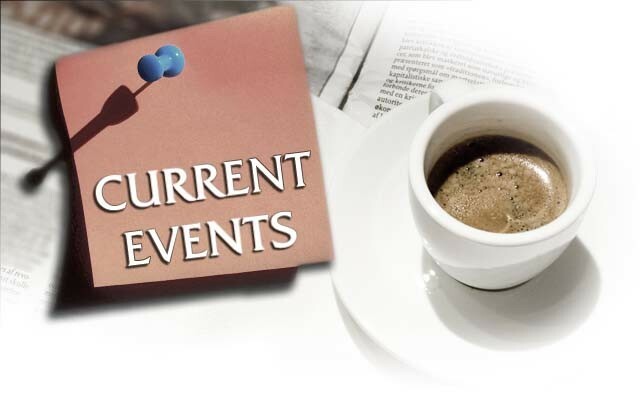 This year's statewide Social Studies conference will be held in the Sheraton Hotel in Tyson's Corner. It will be October 24 and 25. To attend, check with your school building administration. Last year it was in Roanoke, so not a lot of people were able to attend. Hopefully, more people will this year. 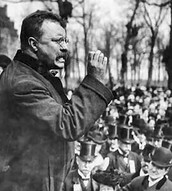 The Virginia Historical Society enthusiastically announces its fall session of “Primarily Virginia”, an online teachers’ institute that highlights the collections of the VHS and the Library of Congress while emphasizing both primary source learning and historical inquiry. Registration has started and the first class begins Sept. 24. In Amanda Hach's AP US History class (and the other APUSH teachers at GAHS), students were challenged to put our Founding Fathers on trial with the hypothetical outcome of the American colonies losing the American Revolution. Students worked as partners to prosecute (two students) and defend (two students) historical figures like Ben Franklin, Patrick Henry, Sam Adams, and others. Students researched online, collaborated in a Google Doc, and used historical evidence and documents to argue their case. 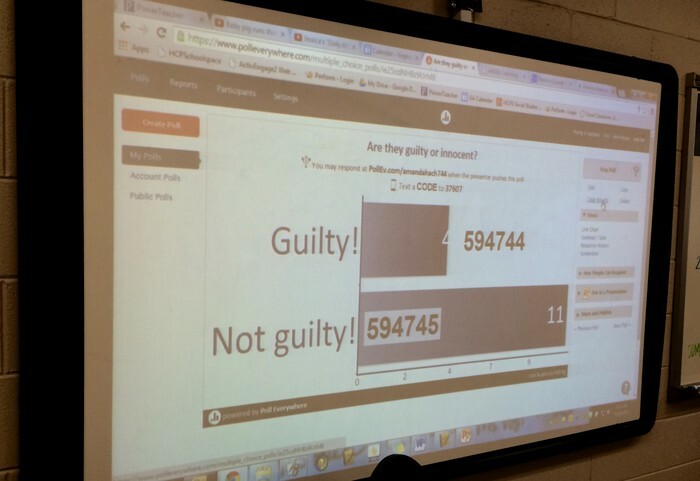 After each side presented their evidence, students used Poll Everywhere on their smart phones to determine innocence or guilt. Best quotation, from his defense team, "Give Patrick Henry liberty, don't give him death." Side note: Franklin innocent. Patrick Henry guilty. 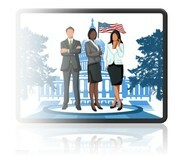 All Middle School Civics and Economics teachers have the opportunity to use EverFi's Commons to help teach Civics content. 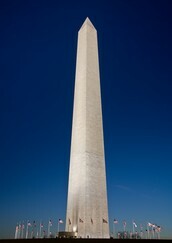 This is an online tool that can be used in class or at home as a "flipped" lesson. All you need are the correct codes and students can then self-enroll. Codes have been emailed to your department chairs. The beauty of the site is that it tracks the students for you. You do little work!! A great online tool for vocabulary are sites that allow students to create flashcards or other vocabulary games. A great site is Study Stack which allows students to import vocabulary and play many games to help remind them of key terms. Furthermore, I saw a YouTube video about using a spreadsheet to help students import their vocabulary. It's awesome, and here's a link to the spreadsheet I made as an example. Students then log into their Study Stack and pastes column 3 into the import box. It seems like a lot of steps, but watching if you see it done, it's easy. By typing in definitions on their own, this helps the student learn vocabulary at one level. By quickly being able to add maybe dozens of words into Study Stack is a quick and easy way for students to have a study tool for later. Ryan Burgess at Freeman High School shared another video site with her students to help them prepare for the new APUSH redesign. Adam Norris has set up a spot on YouTube to share his videos with all APUSH teachers for free. It would also work with any US History class should you want to use videos as homework. He also has videos for AP Government. Check out the videos below. Gilder Lehrman is helping out APUSH teachers. They have a new resource coming out very soon to help you and students with the new curriculum. The video below explains it. It's not ready yet, but click here, and you can sign up for more updates. Using YouTube has become even better. 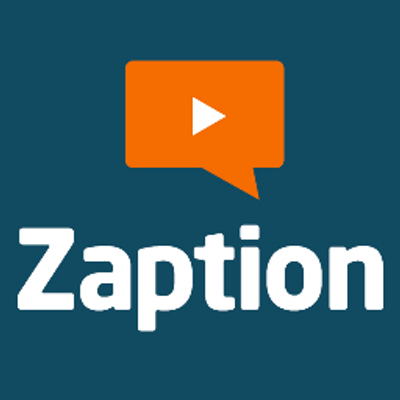 With Zaption, you can take any video on YouTube, or one you make, and insert interactive tools for students to use. You can insert commentary to help reiterate a point made in the video or add multiple choice questions to make sure they are paying attention. 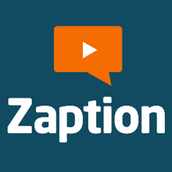 Zaption also keeps student data so you can see how well your students did on the questions. This can probably be a tool students use for class projects. 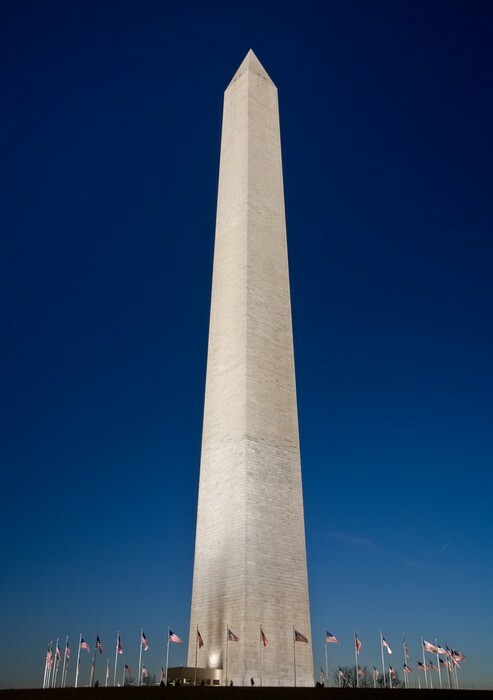 Here's an example of one I made for Constitution Day. Getting students to read Social Studies material is critical. Hopefully, you're doing this with your students every day in a critical thinking way. 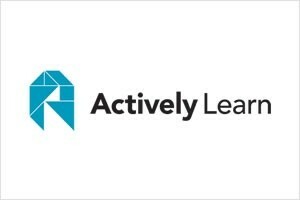 Actively Learn is a great tool to help with this. Schuyler V. at Glen Allen showed me this tool he plans on using daily. Here's an example of a reading assignment I created for Constitution Day. 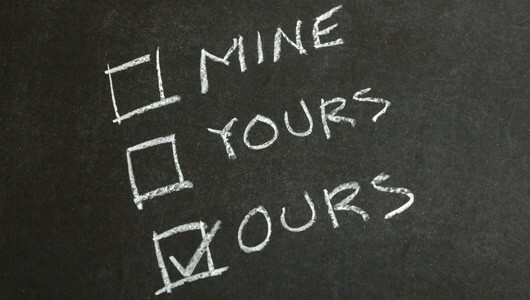 To access the one I created, sign up as a student, and then use class code eea03 to sign in. That's how kids would join your class. Once you're in, you'll see the reading assignment. Just answer the questions while you read. This week: Who won for the best party in Iceland? Last week: No one guessed at all.... I'm on the board! Which member of a current day basketball team helped defeat the Soviet Union? Pope John Paul II... an honorary member of the Harlem Globetrotters. Right now, our new war is the big news. A discussion can be made that President Obama is keeping the the streak alive as the fourth President in a row to start bombing Iraq. Another interesting part of this is how social media is playing a part in the war. Ebola: Disease has made it to the history books before, especially when it wipes out millions of people. Every day, new numbers come out for what Ebola can do to West Africa if it's not put in check. Will this happen? A great discussion on the international reaction to Ebola. There are many ways to view "fitness." 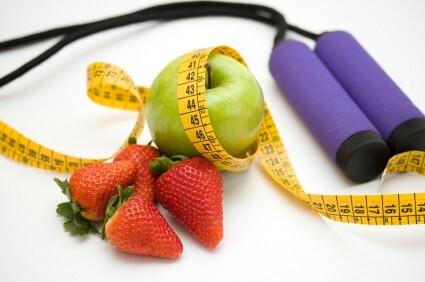 It can be exercise, diet, mental health, general health, and problem some other categories. No matter which one it is, I've found that the best way to succeed with a plan is by making it fun and making it work. So let's take my journey. I decided on running. Why? I could start for free... basically. Since I had shoes, shirts, and shorts, I could run. Anywhere. Since then, I've dropped a few Benjamins on my running gear, but it's been worth it. If you've never run, go for a walk. Today. Really... it's nice outside. Find a support group. You can join training teams, but you can also find groups on Facebook and Pinterest to help you get started. There are 1000s of people out there who get very excited when someone starts running.... Tell me! I'll be just as excited for you. Here's a training program that works very well. It's called "Couch to 5k." It builds you up so you can run a 5k. Enter into a 5k! Once you drop $30 on a race, you'll be more motivated to keep going out there. Most 5ks are charitable, so you're bound to find one that you'd like to donate to. Brag about running. Most people will think you're crazy for running more than a mile, and once someone calls you crazy for that, you'll want to run 2 miles. It's flexible. You don't have to wait for a gym to open, or drive to a gym. Just open your front door whenever you're awake. Keep data! It's fun to see your growth over time and helps get other people motivating you. There are apps like Nike+, Runtastic, and others. I should probably give the typical disclaimer: please seek input from your doctor before trying anything new in life.